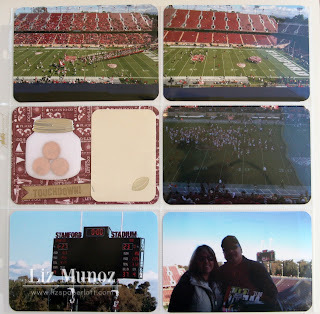 Liz's Paper Loft: Scrapping The Little Things ~ Stanford Footbal! Today is Scrapping the Little Things with My Creative Time! I'm still new to Project Life style of scrapbooking, however I really like it! 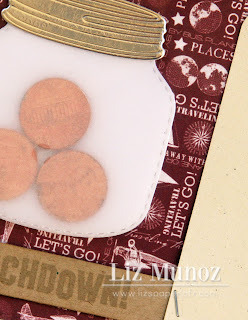 We were all asked to use the new Stitched Chunky Jar Die. I knew instantly what pictures I wanted to scrap! 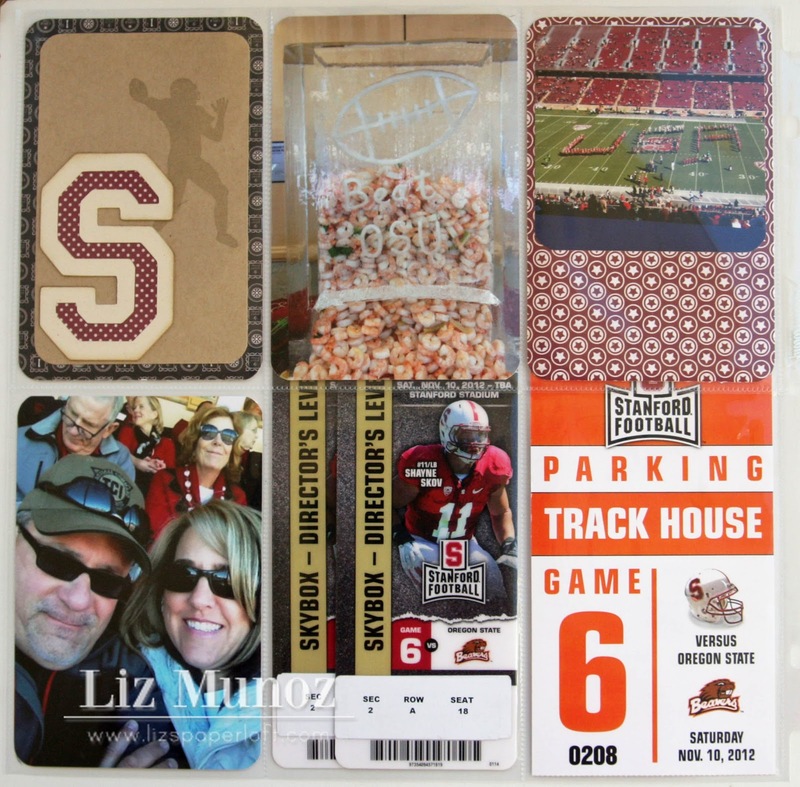 My layout is from a Stanford football game that my husband had found tickets on craigslist. He texted me and told me he had found tickets for the game, but they were kind of pricey for a college game but they seemed like they'd be good seats. I rarely care where we sit as long as I can get some nachos, I'm a happy girl. :) So we meet the guy for the tickets...you never know how that's going to go...he gets back in the car and hands me these plastic things on lanyards and a parking pass. He tells me these are the tickets. hmmm? They say sky box on them, not really sure what that means for a college game. So on our way we go, hoping that these are for real! Well, they were for real, and we sat in the seats of a couple that donated well over 50 million dollars to the school. Not only did we have great seats, but it came with a buffet, and all the traditional stadium food you could want! We were definitely out of our element! A great layout and especially your story!! TFS! Nice job...great pics! Love how much you got in here. Great job. Such a cool story, love the LO. Ohhhhh Liz what a fantastic story you held my attention and I had my fingers crossed whew for real!! Great pages wow you truly did an awesome job on these you may be a newbie to this but you are really really good!! Wow!! 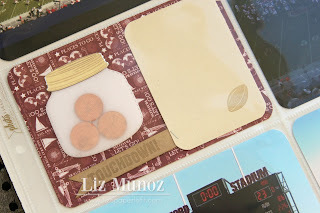 Not only did you not get ripped off but you scored some of the best tickets you could have gotten :D The pennies in the jar are perfect for your page as are the football and player stamp. Great job! Liz ~ Oh these are seriously an AMAZING layouts!! Okay the pictures are AWESOME!! How CUTE to use the jar dies and put pennies in them!! LOVE it! 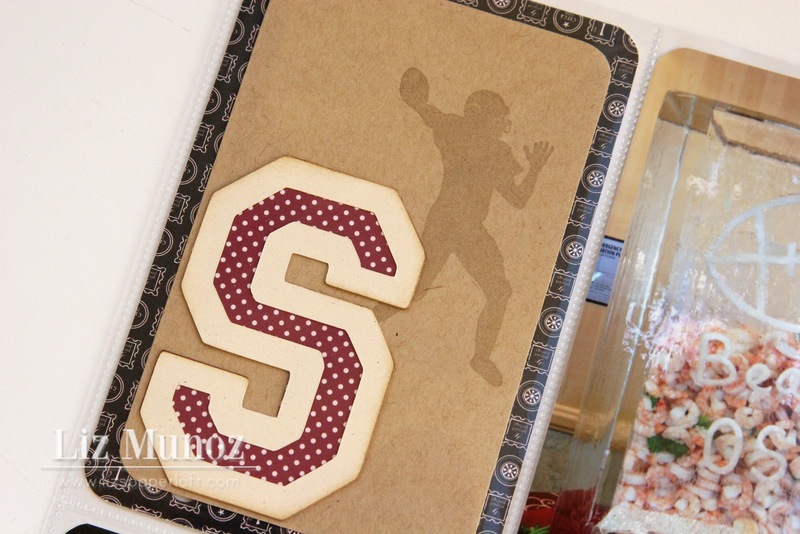 I LOVE how you used the football player as a background paper!! GREAT keeps sakes too! Oh I bet sitting in the VIP seats was over the top and lets NOT talk about the nachos ~ I will want them!! Awesome job!